It must be tough being a Centurion. You're basically just expendable cannon fodder, you don't download into a new body when you get blown up, you're at the whim of capricious humanoid models, and you don't get any of their cool upgrades, like names and opinions and orgasms. You don't even get to say "By your command, Imperious Leader!" in that cool metallic voice any more. It's no wonder they like shooting stuff so much, it's the only outlet the poor things have. 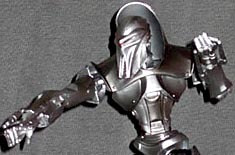 Upgraded by the Cylons and tasked with destroying the remnants of humanity, the Cylon Centurions possess a deadly arsenal comprised of elongated claws, double-barreled armor-piercing firearms and even mortars and missile systems. Still, could be worse. 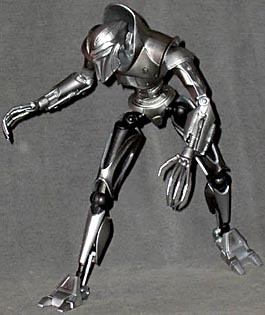 After all, the old ones were basically guys in ill-fitting armour (which was probably bloody hot under studio lights) whose purpose was to march around ineffectually and get shot, whereas at least the current model can present something of a danger to the good guys for more than three seconds at a time. And they look a lot better, all sleek CGI malevolence, rather than an underpaid stuntman in a tin can suit - indeed, part of the design ethos of the new-model Centurion was to make it plain that there couldn't be an actor inside it, CGI or not. Though one thing I still don't understand - why are they called "Centurions?" Screw the Final One, I want to know where the hundred sub-Centurion Cylons are hiding. Possibly they're hiding behind the Centurion - it may be thin, but it's a big bugger and no mistake. 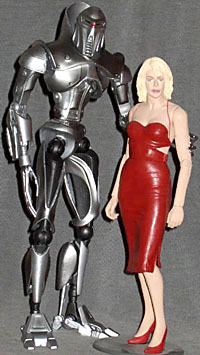 It stands just under 8½" tall at full stretch, towering over the humans and humanoids in the Battlestar Galactica line. The vast majority of it is cast in colour, rather than painted - from my inspection, I believe the only paint on it is the eye, a tiny symbol on the chest, and the silver shins, which are painted over the black plastic "skeleton." 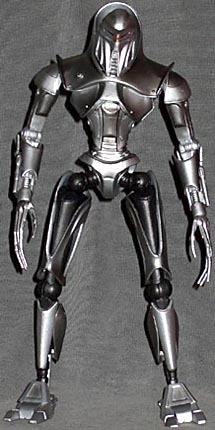 Elsewhere it's just silver plastic - or in the case of the thighs, a silver casing over black limbs - but the look of the figure is quite convincing, with very little cast swirling or discolouration. Broad, flat areas like the shoulders and collar are surprisingly unmarred, so either Diamond Select is giving the silver plastic an extra coat of spray just to clean it up, or they're being extra-careful how they cast metallics nowadays. Like all "robot" Cylons, the Centurion has the distinctive Knight Rider red dot bouncing back and forth in its eye slit - except of course you can't do that with an action figure, at least not at this price point. The eye slit is painted black, with the red "eye" set in the center, a decent if unremarkable solution, but for the most part the metallic glint of the facial features, especially the glaring "brow," overshadows the eye anyway. Articulation is pretty darned plentiful, and for the most part artfully concealed. The head is quite mobile, despite the high collar, with a swivel/peg balljoint at both the bottom of the neck and the top at the base of the skull, allowing the Centurion to crane its neck forwards, and then turn its head from side to side when it's at full stretch. The two joints in combination allow a wealth of posing options, so full marks there. The torso contains a rocker joint hidden in the sternum, which works neatly with the craning neck, as well as a waist, fairly invisible in the robotic seams above the hip piece. Each arm has a swivel/peg balljoint in the shoulder, and a second swivel at the top of the biceps - this swivel is restricted somewhat by the shoulder plate sitting over it, but there's a good 45° of motion in it either way, which is enough for most purposes. There's a balljointed elbow and a swivel wrist - it's actually a balljoint, but it sits too snugly in its housing to tilt. From the waist down the Centurion has balljoint hips - swivel/pegs with another swivel right beneath the ball at the top of the thigh, which amounts to much the same thing - peg knees, and peg ankles. The ankles are a bit restricted, presumably so as to allow the "Achilles tendon" piston to function - the piston rod slides in and out of the housing in the shin as the foot tilts, but the ankle joint is a ratcheted peg that only really has two positions, either flat, or with the toes pointing down a bit. The inability to tilt the foot up, so as to remain flat on the ground when the leg is angled forward, is really the only articulation limitation worth mentioning. Luckily the feet are big and stable, and even with the back foot at an angle to the surface it's on, the Centurion can be made to stand up fairly easily in wide combat stances. Making up for the Six figure, who didn't have any accessories (though I actually bought this figure to be an accessory for her), the Centurion has a range of bits, all concerned with its hands. There are three separate pairs of hands - clenched fists, open "claws," and more or less flat hands. The flat pair have a tendency to be slightly warped, what with being stuck in their packaging for however long it takes them to arrive on store shelves - mine has the tips of two fingers on its left hand crossed, but it's nothing dreadful (maybe it's hoping for luck). There are also two sets of forearm modules, representing the built-in cannons either stowed or deployed (triple-barrelled, rather than double). The Centurion is packaged with the cannons deployed, around clenched fists, and all the figures I saw had some degree of bending on one or other of the cannon barrels. It's irritating, but not a major defect - I didn't see any with more than one barrel (usually a side one) bent per arm, and it's not much effort to find a display pose where the bent barrel is concealed by the arm. Swapping the forearm modules is a bit of a hassle, though - they're mounted on two headed pegs, very snugly, so you really need to get a good grip on them to get them loose, and more so to get them back on. Trying to use the wrist as leverage is pointless - and possibly damaging - since it's soft plastic, to accommodate the plugs of the swappable hands; the best bet seems to be to use the tips of the small inner forearm modules as leverage (ignoring the pain - they're a bit sharp), and pull the swappable outer forearms back from the front. It can be done, and once you have the knack of it it's not much trouble, but the first couple of times can be trying. That's about it for the Centurion, and a very impressive figure it is. The swappable forearms are something you can adapt to, leaving the ankles the only irritation, and that's of negligible importance. If you think it looks good, go buy it, and you won't be disappointed.